Varied and creative, with several downright beautiful tracks. Macross Plus is one of the most beautiful pieces of animation I've ever seen, and this first soundtrack (of two) captures a diverse cross section of the varied moods of that series. As you might expect from the master composer Yohko Kanno, there are a wide variety of musical genres represented here; several of the tracks would fit perfectly into a classical repertoire, two others are the surreal pop music of Sharon Apple, and then there is Myung's Theme, which almost belongs in a category all its own. The bulk of the pieces are of classical flavor; most are light, and a couple are downright bubbly. Given Kanno's uncanny ability to make any musical genre hers, and further to excel within its boundaries, it's no surprise that all of these pieces sound almost indistinguishable from works by the old masters--beautifully composed, varied, and quite complex. My only disappointment--which is slight and due entirely to my personal preference--is that even the darker classical pieces lack a bit of a hard edge, though that's entirely true to form. There's still plenty of variety--"In captivity" is darker and there is a sad, lyrical quality to the simple piano themes of "More than 3cm." The score is richly preformed by the Israel Philharmonic, and the range and variety of the full complement of instruments is well explored. Of special note is the first piece, the Macross National Anthem; not quite classical in spirit, this is nonetheless a beautiful tune. Low-key yet swelling with emotion, the piece evokes a sense of wonder and adventure without becoming over-dramatic or bombastic. Then there are tracks 3 and 11, from the Sharon Apple performances. Stuck somewhere between rock and ancient chanting, these are in a much more modern, surreal vein than the rest of this disc. "After, in the Dark" starts out with a long intro riff accompanied by a screaming crowd and makes it's way into a mostly traditional rock song, but sung almost unintelligibly and touched by Middle Eastern themes. About halfway through the 9 minute piece, the exotic themes take over entirely and we have the eerie Torch Song, reminiscent of some sort of Hindi chanting. The piece as a whole has a slightly alien feel to it, which is even more prevalent in the other Sharon Apple song, "Santi-U." The most unusual piece on the disc, it is heavy on primitive drumbeats and quiet synth work, and sung in an eerie, distant-sounding voice. Throughout there are odd whispers and disjointed radio samples, and part way through the piece moves into a driving tribal beat, then finishes quietly. Kanno does some very interesting experimental work in these two pieces (Santi-U in particular), and not only did she effectively evoke music composed by a computer, I enjoyed the effect, and thought it was beautiful at times. Finally, there is the iconic "Voices," in my opinion one of the most hauntingly beautiful anime songs of all time. There are two versions of it on the disc, both well worth listening to. The acoustic version starts out with a piano version of the theme, and moves into a more complex orchestral piece. As beautiful as that is, the vocal version is a masterpiece; the melody is simple, sad, and a touch mysterious, and by turns mournful, uplifting, and wistful. This would be enough on it's own (evidenced by the acoustic version), but the vocals, by longtime Kanno collaborator Akino Arai, are the perfect medium for this song; her beautiful voice is airy and has a slight sadness to it that perfectly compliments the melody. The version on this disc is joined early on by some synthesized percussion, which compliments it well, but I think that the beginning and end, sung solo, are the best parts--in the echoing silence, you can hear each intake of breath, which becomes part of the song and makes it all the more personal. I would have preferred a completely or almost completely a cappella version of this piece, but even these versions are so beautiful they're worth the price of the disc by themselves. In all, though far from casual listening material, this is a varied soundtrack with both genre-perfect classical orchestral compositions and some creative experiments by Kanno. Although I personally enjoyed several, I don't think that the classically themed pieces are likely to appeal to many fans of either Macross or anime music in general, but they are rich and well-written nonetheless for those inclined toward classical. You, like I, might also find something to love in the two surreal and creative Sharon Apple pieces. But in any case, Voices is worth buying the disc for, even if you don't listen to any of the other tracks. Available in the US from JVC and later AnimeTrax; both are out of print but relatively easy to find. 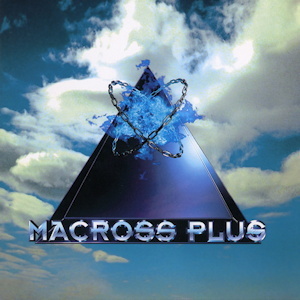 Note that Amazon has samples of all the tracks: Macross Plus OST I .
Macross Plus OST I is under copyright of its owner. Any images are the property of their respective rightsholders, and included for review purposes only under the fair-use clause of US copyright law.